Over the next 11 weeks I’ll dig deep into the 2014 Coachella Music Festival lineup, featuring one band per day. The purpose of this piece is to assist in difficult decisions that inevitably you’ll need to make, as well as, serve as a fun countdown to Coachella Week. Note: All bands appear in a completely random order… Enjoy, and let the countdown continue! Check out previous days here. 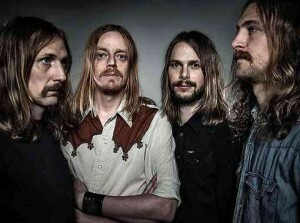 Graveyard are a heavy metal quartet from Gothenburg, Sweden that formed in 2006. Leading up to their formation in 2006, band members were part of other hot Scandinavian metals acts such as Norrsken and Albatross, I’m sure you remember them. The band came together because of their love for Black Sabbath and Cream, but cite early Fleetwood Mac’s bluesy vibe combined with Slayer as their motivation. We’ll there you go! blogger can’t seem to locate anything. From the looks of these guys it appears they’re in the early stages of planning a visit to Portland, Oregon.